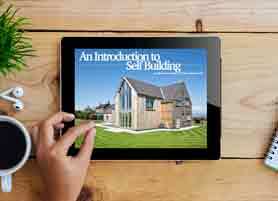 Every year more and more self-builders decide to invest in green sources of energy when building their homes. By installing renewables you are not only helping to save the environment, but it will allow you to save on energy bills in the long run. The initial costs related to the installation of the technology are expensive, but the introduction of the Renewable Heat Incentive by the government will let you retrieve some of those costs. Magic box International created a series of products using thermodynamic solar assisted heat pump technology. We will hand over to company director David Norris to introduce the technology and to tell us more about their products. WHAT IS THERMODYNAMIC SOLAR ASSISTED HEAT PUMP? First, we need to answer the question what is thermodynamic solar assisted heat pump? This solution can be described as ‘a fridge in reverse’ – the panel installed on the back of our fridges is responsible for keeping the device cold. When you reverse this principle by using an aluminium collector to absorb heat (instead of rejecting it), you can utilise the ambient air temperature to change the refrigerant liquid to a gas form. This state of the refrigerant lets us capture energy and pass it through the heat exchanger. 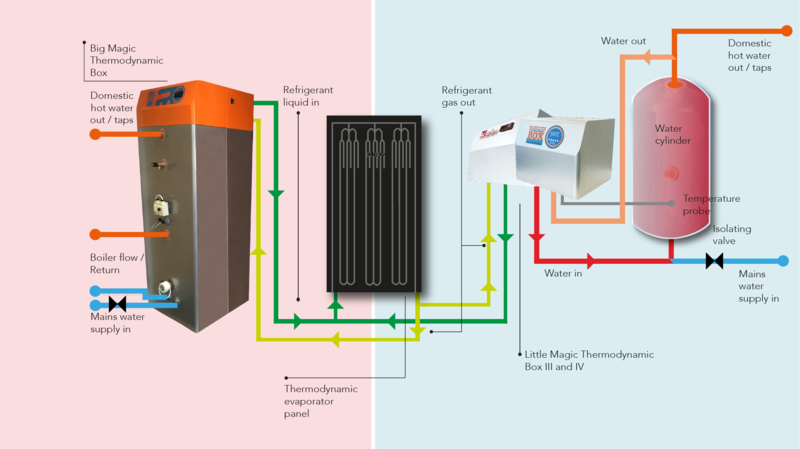 The Little Magic Thermodynamic Box (LMTB) III and IV will Retrofit thermodynamic SAHP where the water from the cylinder is brought to the other side of the heat exchanger and the heat from the refrigerant is passed to the water until it reaches 55°C. The Big Magic Thermodynamic Box (BMTB) works as an integrated cylinder thermodynamic SAHP where an external coil which is wrapped around the outside of the cylinder. The heat from the coil is then passed into the cylinder until the water reaches 55°C. The LMTB and the BTMB are suitable solutions for countries like the United Kingdom where we do not have too many hot sunny days. 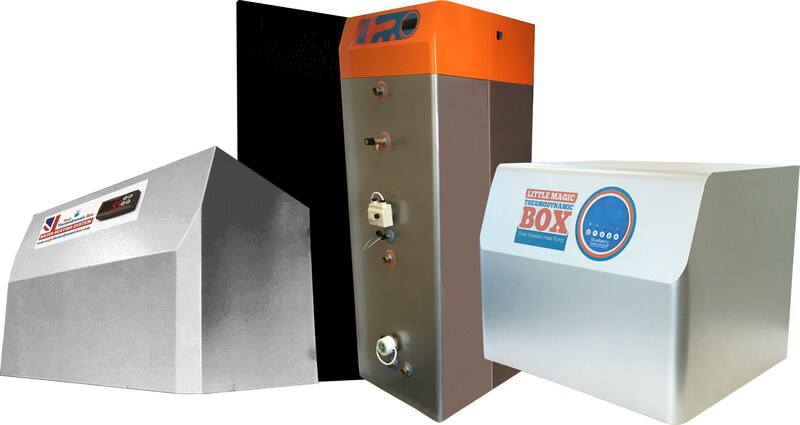 The work on Magic Box started in 2013 and revolutionized the way we can heat domestic hot water. It appeared on the TV programme Grand Designs, and now the company have a family of products with Microgeneration Certification Scheme accreditation and are operating internationally as an alternative solution for domestic hot water. 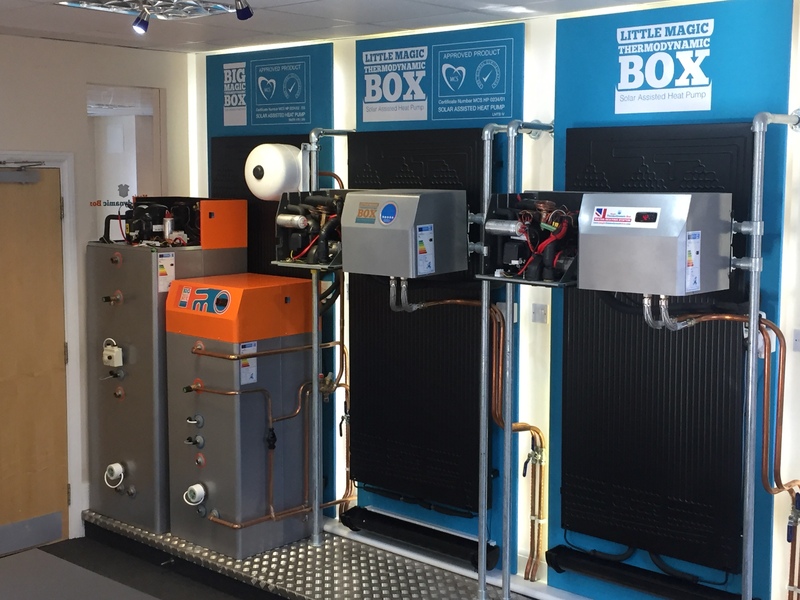 Low carbon projects have always had a question mark over the provision of hot water but this is no longer a grey area as Magic box International can provide a solution in almost every situation, a typical system can be installed in under one day. The system works effortlessly producing hot water both day and night all year round. The team now have a section of their business purely dealing with Self Build and all modular design and build companies. Embracing modern design and the needs of low carbon buildings – the company can assist with initial heat demand computations, right through to delivering product specifications. The company has recently fulfilled an order for two SIPS properties in Lanark, Scotland where we installed two BMTB 200L all-in-one systems both an A Rated cylinder and A Rated Heat pump. There are many interested parties looking to utilise the products on an abundance of forthcoming and current projects. Magic Box International have strong links at the BRE (The Building Research Establishment) and carried out all their testing within the facility, as of today their products can be seen within eco houses on site within the Eco Village – proving that the technology is a great solution for heating hot water efficiently and in a low carbon method. HOW MUCH CAN THE SELF-BUILDER SAVE ON MAGIC BOX IN THE LONG RUN? 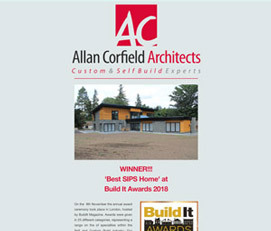 Currently we are seeing a common theme of self-builders trying to achieve a very tight envelope, albeit they may not go the complete way of having a passive certified house, they are trying to achieve similar standards. Furthermore they are looking to achieve a property with zero or minimal utility costs. Our products complement this goal that is looking to be achieved and so when specified in conjunction with other renewable energy type technologies, the result will be significant savings for the prospective home owner with minimal utility costs, for the rest of the products life. AT WHAT STAGE OF A SELF-BUILD PROJECT SHOULD THE INSTALLATION OF WATER HEATING SOLUTION BE CONSIDERED? It should be considered at the outset so it can be integrated clearly into the specification of the build. Additionally, our flagship BMTB Thermodynamic Hot Water System is also able to integrate with a MVHR system in an integrated turnkey solution. By considering these types of products early, it allows for all design options to be considered and then maximised. With early consideration, the location and size of a plant room can be carefully planned and it can be agreed, where the renewable technology will be located, for example the BMTB unit and MVHR system may be fitted in an attic space. Considering pipe and duct runs is also vital in creating a cost effective and efficient system. We would like to thank David Norris for his expert contribution to ACA’s blog. If you are interested in using the Magic Box International’s services for your Self Build project send David an email to david@magicboxinternational.com and discuss the options.